Did you know that the Frying Pan Lake near Rotorua is the world’s largest hot water spring, with temperatures reaching 200?C at its deepest point? It comes as no surprise that curious travelers are completely awed as soon as they set foot in this shimmering wonderland. 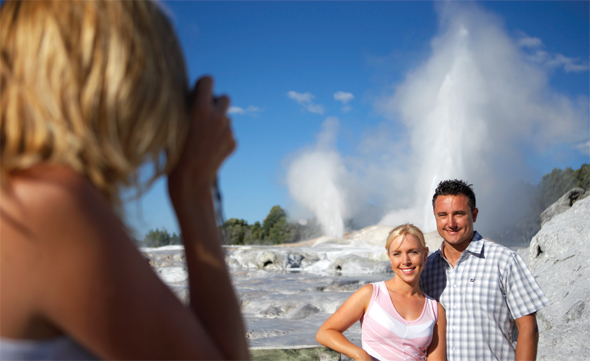 The geothermal city of Rotorua is the heartland of New Zealand’s Maori culture with its unique volcanic landscape, living Maori culture, natural hot springs and plenty of options for family fun time. Located in the North Island, Rotorua sits squarely on the Pacific Ring of Fire, thus volcanic activity has become integral to the city’s history and character. It is also the tribal home of the Te Arawa people who settled in lakeside geothermal areas more than 600 years ago. The place delivers awe-inspiring experiences: geothermal phenomena (geysers, boiling mud pools), unique Maori culture (marae stays, hangi feasts, an authentic pre-European Maori village) and natural assets (fantastic trout fishing in one of its 16 lakes). With a well-developed adventure culture, this sizzling place has some of the world’s best mountain bike trails, walking tracks, indulgent spa therapies), and adventure (sky diving, jet boating, zorbing). Agrodome is an awesome theme park that everyone, no matter what age, will truly enjoy. Situated on a scenic 160-hectare sheep and beef farm, it is an educational and hands-on experience that shouldn’t be missed. It offers visitors a fun and interactive experience in Kiwi farming that includes meeting lovable animals in the flesh (including goats, cattle, deer, alpacas and ostriches) and taking part in its famed sheep shearing exercise. For thrill-seekers: try bungee jumping, zorbing, Swoop, Freefall Xtreme, Agrojet, Shweed, Helipro and more. Catch the Sheep Show for insight into the world of New Zealand agriculture, featuring 19 breeds of sheep, sheep shearing, cow milking, lamb feeding and dog demonstrations. There are three shows daily at 9.30am, 11.00am and 2.30pm. 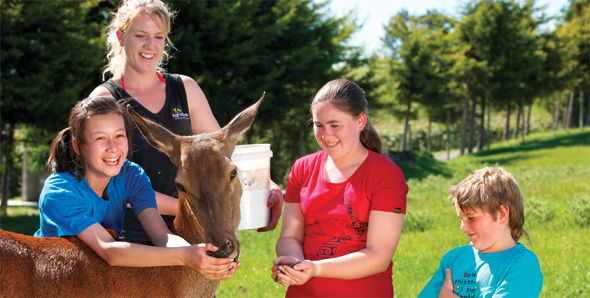 Join the Organic Farm Tour to interact with a variety of farm animals, and visit the Organic Orchard for honey and kiwifruit juice tasting. Farm Tours depart daily at 10.40am, 12.10pm, 1.30pm and 3.40pm. Drop in on the Woollen Mill and Shearing Shed to learn about the process of making wool. In case you missed the Sheep Show, the Farmyard Nursery is the place where you can come up close and personal with the smallest – and cutest – baby farm animals. Now’s your chance to pet one. An evening at Mitai will give you an authentic introduction to Maori culture, leaving you amazed and in awe. Enter the world of Mitai. Be enthralled by the natural bush setting, see warriors in traditional dress paddle an ancient warrior canoe (waka) down the Wai-o-whiro stream, and don’t miss your only opportunity in the Rotorua area to see glowworms in their natural habitat. Be captivated by the displays of weaponry and combat, coupled with the grace and beauty of the poi dance. The spine-tingling haka finale’ is astounding. The Mitai family is proud to have created a sacred and spiritual place that offers you an indigenous cultural experience like no other. There’s no better way to rejuvenate both the body and mind. 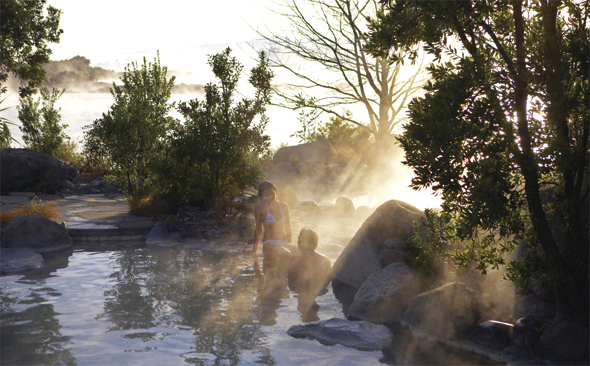 Polynesian Spa is New Zealand’s leading international day spa, providing a unique thermal spa experience swathed in a picturesque, tranquil setting overlooking Lake Rotorua. Visitors can enjoy a relaxing hot spring bath in any of the spa’s 26 hot spring pools, which are offered in four areas, including a choice of deluxe, adult, private or family pools. For a more indulging experience, choose from a range of sumptuous spa and massage therapies such as hydro and dry relaxation spa treatments. Pick from an intriguing assortment of exfoliations, polishes, wraps, replenishments and massages, which are applied to the back or body, face, legs or feet. Imagine a manuka honey and lavender body polish, or thermal mud or kiwifruit soufflé body wrap! Or go for a water-based hydro spa therapy with the popular Aix Spa Massage, introduced in France in the early 1900’s and available at Polynesian Spa for over thirty years. Enjoy this smooth flowing, fragrant coconut oil massage under jets of warm water. Discover the great stories of the Rotorua region through the museum’s innovative exhibitions and cinema experiences. Learn about the rich culture, volatile landscape and legendary figures that have shaped this fascinating region. Whether you have an hour or a day, you will find plenty of entertainment at Rotorua Museum. The stunning Bath House building can be explored from the mud bath basement to the viewing platform on the rooftop. Housed in the historic Bath House building (Government Gardens), the museum is the guardian of a building holding the highest classification under the New Zealand Historic Places Act. As a storehouse of the community’s treasures, the museum is responsible for several important collections. Te Puia is home to Pohutu geyser, national carving and weaving schools, and the world-famous Whakarewarewa guides. Te Pe’ is Te Puia’s evening cultural experience, a cultural feast of enriching storytelling, entertainment and Maori kai (indigenous food). Te Heketanga a Rangi (heavenly origins) comprises twelve monumental contemporary carvings reaching skywards, each representing a celestial guardian in Te Arawa culture. Step into its ancient valley where geysers, including the famed Pohutu geyser, mud pools, and boiling watersa re still attracting visitors after 40,000 years. Meet some of New Zealand’s unique animals. Marvel at the tuatara (a type of lizard that has survived over 100 million years). Call on 16 different breeds of native birds in aviaries and surrounding landscapes, including paradise ducks and the kiwi. Don’t forget to look for the long-finned eel that has been living in the park for over 60 years. The park is also home to many rainbow, brown and tiger trout that reside in the spring-fed pools. Feed them and watch them from the underwater viewing area. Learn about the Kiwi Bird at Kiwi Encounter. The 2011/12 season anticipates the first Kiwi baby hatching on the 13th of August. Last season, Kiwi Encounter hatched over 130 kiwi chicks. Sudima Hotel Lake Rotorua is the largest hotel in the city, sitting pretty on the shores of beautiful Lake Rotorua. The 248-room accommodation, many with superb views of the lake, is also adjacent to the renowned Polynesian Spa complex and just a short stroll from the Rotorua Convention Centre and the vibrant city centre. Sudima Hotel offers the perfect start or end to a day with a divine meal in Lakes Restaurant that is sure to delight your taste buds; including first-class service and a fresh approach to top-quality dining. You will always find prime New Zealand meats and fresh seafood on the a la Carte menu, artfully prepared with the finest seasonal ingredients. The menu offers something for everyone, from Pacific Rim dishes to vegetarian options and international cuisine. Meet your friends in the warm atmosphere of Mallards Bar, adjacent to Lakes Restaurant. Sample award winning wines, imported beers and spirits as well as great espresso coffee and non-alcoholic selections. Mallards Bar also has wireless broadband Internet so you can relax and catch-up with friends and family in a relaxing atmosphere. With cheap Barbados Holidays there are many opportunities to have fun. There are enough sports and activities to keep everyone busy on or off the beach. Night-life is vibrant and the beach is beautiful.